The Dantes Family’s photoshoot was super trending. The likes on the photos of Marian, Dingdong and Zia posted on their Instagram recieved almost half a million likes. The photos are so cute no wonder it got so many likes and went viral. In the photo we can see Marian showing her tummy while doing a duck-face. Zia followed her Mom and showed her tummy as well and so as Dingdong. “Last photoshoot before I pop! Excited to meet our little one. Exclusive BTS on The Dantes Squad.” Marian posted. Fans who were very happy bombarded the post. And so as fellow celebrities. 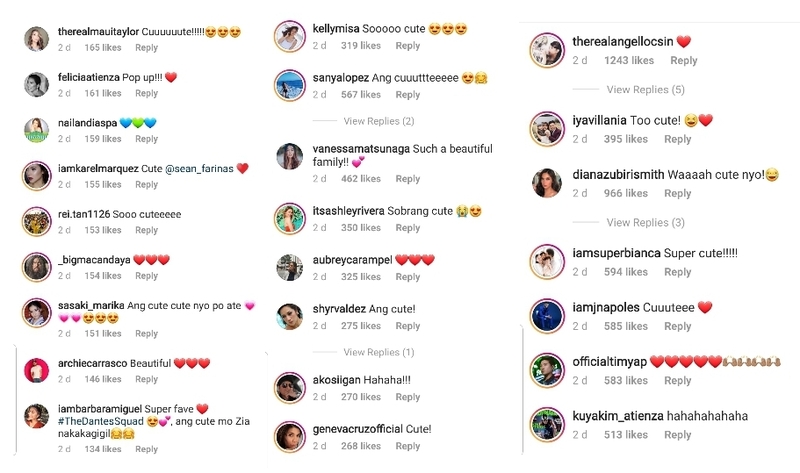 Both Kapuso and Kapamilya celebrities commented how cute the Dantes Squad. Celebrities like Angel Locsin, Bianca Gonzales, Iya Villana, Mariel Padilla, Vanessa Matsunaga, Geneva Cruz, Maui Taylor, Maritoni Gonzaga, Christine Babao, and Vice Ganda express their admiration to Dantes Family. Marian Will be giving birth anytime now, Dingdong is not even leaving the house in anticipation of Marian giving birth. Many fans are also excited and praying for Marian and Baby boy’s safety. They have started the novena for Marian’s healthy delivery and hopefully normal. Dingdong and Marian haven’t announce the official name of their baby boy yet. But many are guessing he will be named after his Daddy, will they name him JD4? We have to wait and see..